Regardless of how the British public votes today, one outcome is guaranteed: the UK will end up with some form of either a Labour government or a Conservative government. The two largest political parties in Britain have several differences in policy. The Conservatives support a referendum on UK membership of the European Union (EU), for example, something which Labour is strongly against. Labour, meanwhile, pledges to introduce a mansion tax for the wealthy, a move the Tories are opposed to. Beneath these differences however, much of the two parties’ policies reflect a Westminster consensus. RT explore three important issues of this general election that Labour and the Conservatives agree on, but which remain highly contested among the general public. These center-left parties pledge to dismantle Trident when it comes up for renewal next year. 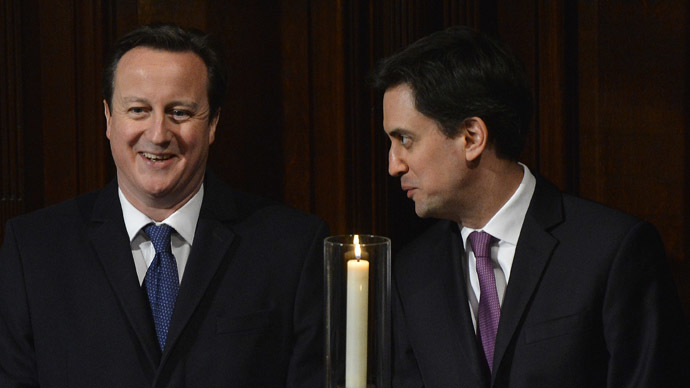 Both Miliband and Cameron have accused each other of “playing politics” with Trident in the general election. Despite the accusations, both parties support a renewal of Britain’s nuclear weapons program. However beneath Labour’s official policy there is a significant level of dissent among the party’s prospective parliamentary candidates. A survey by the Campaign for Nuclear Disarmament (CND) found 75 percent of Labour’s electoral candidates oppose Trident renewal and want to see a nuclear-free Britain. The Transatlantic Trade and Investment Partnership is a secretly negotiated, free-market pact between the European Union and the United States. Advocates claim it will create growth and jobs across Europe, but critics say it will result in decreasing living standards, massive deregulation, and will remove all barriers to the market and privatization. One controversial clause also enables corporations to sue governments if legislation adversely affects their profits. However, Labour insists it will “hold the European Commission to account on issues of concern,” which includes the impact of public services and the protection of the NHS from privatization. Austerity is a policy of government spending cuts in a bid to reduce the deficit (the difference between its annual expenses and revenues) and national debt. In the UK, these cuts have taken the form of reduced welfare, redundancies across the public sector and a reorganization of the military. Despite being widely criticized by prominent economists and even the International Monetary Fund (IMF), both Labour and the Conservatives promise more austerity if they come to power. Tory Chancellor George Osborne pledged dramatic spending cuts of £33 billion which would reduce government spending to 1930s levels in his autumn statement last year.